Full-Automatic Surface & Interfacial Tensiometer_USA KINO Industry Co., Ltd. Measurement of surface tension (ST) / interface tension (IFT), analysis of equilibrium and dynamic contact angle (CA / DCA) of solid material, contact angle of powder and fiber, as well as measurement of critical micelle concentration (CMC) of surfactant and more are all characterizations of interface chemistry. Series A60 - full-auto weight-based dynamic & static interface chemistry analytical system, equipped with world leading micro-analytical balance, high-precision positioning mechanism controlled by stepper motor, and digital semiconductor temperature sensor, are developed to meet the demand in interface chemistry measurement for high-precision control over the process of R&D and products’ quality. The instrument advantages in such merits as simple operation, high accuracy, complete function and excellent quality. 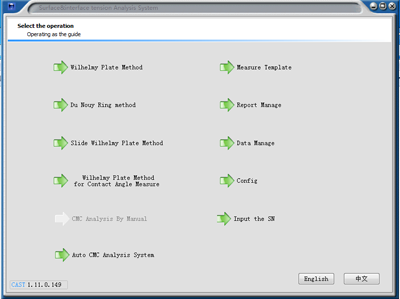 It has powerful data management and covers three different measurement methods, which enable it to be applied extensively in measurement of dynamic / static surface tension (ST), interface tension (IFT), contact angle measurement of solid material, single fiber by Wilhelmy plate based method and Washburn-based method. International design, global sourcing and professional service provide you comprehensive and professional solution in interface chemistry measurement. Our instruments, with their obvious advantages, represent the leading level of weight-based interface chemistry equipment. The latest upgraded model A601S (as shown in the picture) embeds professional customized portable control terminal, with which you can control your interface chemistry analytical process more conveniently. All data can be copied into your U-disk and printed out. Unexpected functions are all designed for you. Series A60 from USA KINO cover the following variants and each part is stand-alone. The mainframe A601 is required to purchase no matter which variants of A60 series you need. Contact angle measurement modules of single fiber, weight-based method, Washburn method for powder are all available in series A60, but they are not included in the standard configuration. Development of printing plate detergent and its wettability analysis, wettability analysis of film, paper, etc. - High data updating speed (23 data/s) and processing with more reliable values. - World’s first rear sensor (A101, A606), useful for volatile & corrosive sample liquid analysis, e.g. liquid ammonia and acid substances, etc. - Double-microchip processing technology, with better data-handling capacity and higher speed of processing. - Upgradeable software, customized to meet your special measurement requirements. - Stepper motor controlled high-precision vertical travel positioning stage, with resolution up to 0.1μm and repetitive-positioning accuracy up to 2μm. - Sample chamber controlled by water circulator offers best temperature control. - Universal USB2.0 communication port provides stronger compatibility, higher speed, and convenient access to laptops and new-model desktops without RS232 port. - One-key zeroing and full-auto measurement with simple and convenient operation, to minimize errors caused by human operation. - Humanizing pre-wetting function, designed for oily sample measurement. Some samples can’t well wetting Wilhelmy plate or DuNoüy ring for the first time, especially for some oily sample. Our uniquely designed pre-wetting function can provide a more humanized solution for you in these cases. Series A60 are equipped with both weighing sensor calibration and self-calibration function of sensing interface (Wilhelmy plate and DuNoüy ring), which is much better than other manufacturers’. It can enable you to control the reliability of measured value more effectively. - USA KINO adopts ionic wind technology to avoid detection error of liquid-gas interface caused by electrostatic. - What is more, ion beam kit module is provided for better anti-static experience. The anti-static device will be always on during measurement. It’s most effective in powder/ fiber measurement to avoid powder electrostatic adsorption and deformation of single fiber. - Usage of glass door with anti-static coating can effectively isolate conduction of electrostatic. - More methods available for you to make a comprehensive solution. USA KINO exclusively provides 3 methods, including classical Wihelmy plate method (slide Wihelmy plate method), modified Wihelmy plate method and DuNoüy ring method. 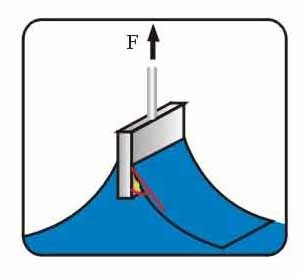 - USA KINO’s innovative 3rd generation Wilhelmy plate method used Young-Laplace equation correction, in which method plate needn’t be immersed and withdrawn in measuring process (such method is called zero buoyance method). It can be used for measurement of dynamic & static surface / interface tension, especially for viscous sample, which enriches measurement technologies of interface chemistry. (3)Professional zero point correction and preset value technology. (1)Software manages all live data that balance acquired. All data can be query and modified as well as exported to Excel. 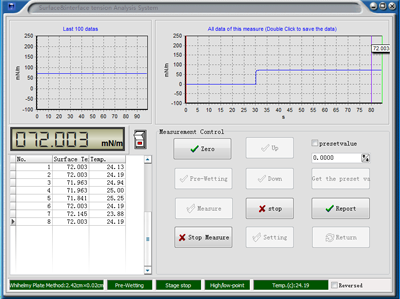 (2)Real-time display of data graph, with observation of interface tension changes. The function provides unparalleled convenience in measuring dynamic surface tension of time-dependent, medium-high viscosity samples, and volatile liquid or mixture. - Powerful database management with data storage, query and modification. (1)Real-time data storage and display, historical data searching, and eigenvalue modification are all available with CAST®1.0. (2)CAST®1.0 saves all the measured data of dynamic value automatically and exports them into Excel. The language interface of CAST®1.0 adopts leading-edge unicode technology, providing you with a user-friendly operation interface. With it, different languages can be switched easily. - Measurement of surface tension and equilibrium surface tension as well as estimation of equilibrium time for surfactant. - Measurement of surface tension and equilibrium surface tension as well as estimation of equilibrium time for medium-high viscosity sample. -Interface tension measurement, especially for plate-upward state in interface tension measurement. 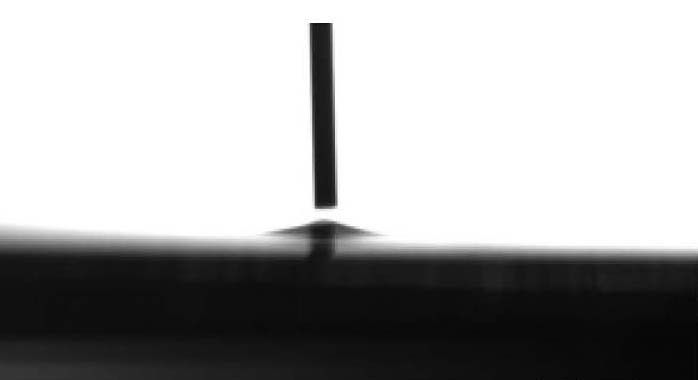 - Measurement of interface tension between monomolecular film and water, etc. - Powerful ion beam antistatic device (optional) for measurement of powder and single fiber with quite satisfactory result. Digital semiconductor temperature sensor made in U.S.A.
-Measurement of surface tension and equilibrium surface tension as well as estimation of equilibrium time for surfactant. -Measurement of surface tension and equilibrium surface tension as well as estimation of equilibrium time for medium-high viscosity sample. -Measurement of interface tension between monomolecular film and water, etc. All above can be customized. Note: It is recommended to confirm your technical schemes with our sales engineer before your purchase to ensure the system can meet all your demands. A604 has the same configuration with A601 except its extended function of powder contact angle measurement. Glass capillary, special holder for powder. Note: Please contact our engineers for confirmation before your purchase. It is not recommended for clients to purchase by yourselves. A605 has the same configuration with A601 except its extended function of fiber contact angle measurement. The system is a stand-alone analytical module based on high-precision weighing sensors with three different sensor resolutions: 0.01mN/m, 0.001mN/m, and 0.0001mN/m. It is especially applicable for: surface tension customization system of on-site assembly line, e.g. quality control of electroplating line, single fiber contact angle measurement, etc. The module enables you to fully take advantage of analytical balance, which can achieve functions of high-precision weighing analysis and density measurement. 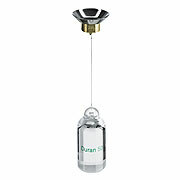 - Water circulator connected to control temperature of samples. 1, The above production pictures and technical specifications are subject to change without notice; and the latest confirmed product information shall prevail. 2, All rights reserved by USA KINO Industry Co., Ltd.